This dresser and mirror is a winning combination. 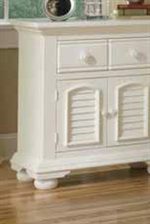 The dresser has six drawers for maximum storage capacity, two doors with signature arched louvered inserts, two adjustable shelves, and bun feet. Other features include solid wood hardware knobs and crown moulding. The mirror is made from solid pine and pine veneers and has an elegant design creating the perfect accent piece. 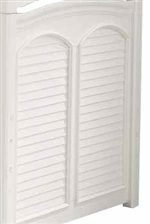 The top features signature arched louvered inserts. The Cottage Traditions High Dresser and Landscape Mirror Combo by American Woodcrafters at AHFA in the area. Product availability may vary. Contact us for the most current availability on this product. The Cottage Traditions collection is a great option if you are looking for Cottage furniture in the area. Browse other items in the Cottage Traditions collection from AHFA in the area.